Dianova is an international NGO composed of associations and foundations operating in four continents. Namely, Americas, Asia, Africa and Europe. Its Members contribute to the development of people and communities through a series of programs and interventions in the health, social and humanitarian fields. > contribution to the mission of the network. > support to the vision. > respect for the core values ​​of Commitment, Solidarity, Tolerance and Internationality. > at the individual level: self and mutual help, self-confidence and integration in their communities. > and at the collective level: civic engagement to promote health and quality of life, contributing to the development of people and communities. As well as the empowerment of the human being as a key factor for sustainable development. Namely, in the fields of economics, social progress and environmental. It is shaped and nourished by the interactions between the International Coordinator (Dianova International, headquartered in Barcelona) and its Members. This cooperation has been reinforced according to the 2007 Lisbon Convention. Dianova is an International NGO of Swiss law under the European Convention of 24 April 1986 on Juridical Personality of International Non-Governmental Organizations. It was granted in 2007 the Special Consultative Status at the Economic and Social Council of the United Nations ECOSOC|UN. And since 2010 is an official partner of UNESCO. Dianova International and its members are totally oriented to quality standards and guidelines established by the public institutions in their respective countries. Besides, are integrated and accredited at national and international networks of the civic society. Among others: Civil Society Forum on Drugs at the European Commission. Organization of American States. RIOD. CICAD. WFTC (World Federation of Therapeutic Communities). Vienna NGO Committee on Drugs. And finally by the Public Administrations and Governments in which its member operate. > a clear mission, organizational structure and decision-making processes. > acting in accordance with declared values ​​and agreed procedures. > ensuring that their programmes achieve results consistent with their objectives. > and communicating these results in an open and precise way. > objectives and results achieved by its programs and advocacy initiatives. > governance structure and processes, including key corporate office holders. > main sources of funding from companies, foundations, governments and individuals. > and financial performance that is in compliance with relevant laws and practices. This is audited by a qualified independent public accountant whose statement accompanies the Report. In 2017, had a team of 499 (53% M and 47% W) multidisciplinary and multicultural professionals. 10.831 people benefited from Dianova programmes developed in 34 residential centers. Is an organization in constant adaptation to the evolution of the contexts in which it operates. And a proactive actor in the Social and Solidarity Economy Sector. Particularly, aims building a more equitable and balanced society. To materialize its Vision 2020, Dianova developed the 2020 Strategic Guidelines based on the principles of Diversification, Internationality, Proactivity and Adaptability. Thus, Dianova builds up step by step as a trustworthy international network. Developing diversified projects, in cooperation with the public and/or private sectors and with direct impact on public policies. In 2015, the United Nations has adopted Agenda 2030 for Sustainable Development. This initiative aims to strengthen the cooperation between governments and other stakeholders. In particular, who strive to eradicate poverty, protect the planet and ensure prosperity for all. The 17 Sustainable Development Goals of the Agenda (SDG) and its 169 specific objectives have become symbols of this ambitious project. Our mission and its implementation found echoe in the context of the Agenda 2030. By implementing a diversity of local and international practices and initiatives, Dianova has a significant impact on the implementation of the SDG. Adding to the global efforts to build a better world for all. And incorporating the language of Agenda 2030 into their work. > Children / Youth and Education. > Protection / Support and Humanitarian Aid. 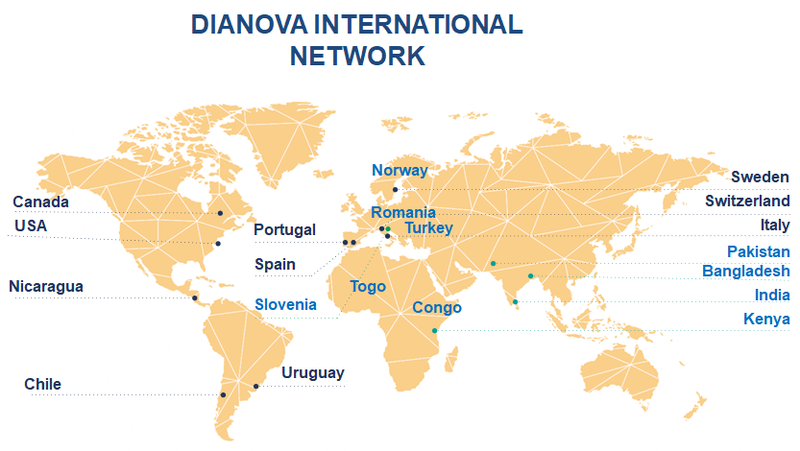 Full and Associated members of the Dianova Network are committed to this involvement on a global scale. Thus, contributing to the achievement of the various goals of the SDG. Dianova International . Dianova Canada . Dianova Chile . Dianova Spain . Dianova USA . Dianova Italy . Dianova Nicaragua . Dianova Sweden . Dianova Uruguai . Društvo Up Slovenia . RIO Norway . European Center for Preventing Addictions Romania . Ray of Hope Pakistan . SPYM Society for the Promotion of Youth and Masses India . Slum Child Foundation Kenya . AJEAH Association des Jeunes Engagés pour l’Action Humanitaire Togo . FAPE Democratic Republic of Congo . Karim Khan Afridi Welfare Foundation – KKAWF Paquistão. Izmir Saglik Turizmi Dernegi (IZSATU) Turquia. Kothowain Bangladesh. GRADH – Groupe de Réflexion des Amis pour le Développement de l’Humain Togo.